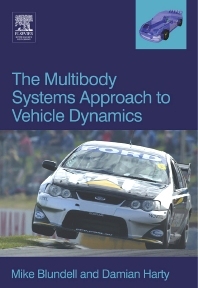 Multibody Systems Approach to Vehicle Dynamics aims to bridge a gap between the subject of classical vehicle dynamics and the general-purpose computer-based discipline known as multibody systems analysis (MBS). The book begins by describing the emergence of MBS and providing an overview of its role in vehicle design and development. This is followed by separate chapters on the modeling, analysis, and post-processing capabilities of a typical simulation software; the modeling and analysis of the suspension system; tire force and moment generating characteristics and subsequent modeling of these in an MBS simulation; and the modeling and assembly of the rest of the vehicle, including the anti-roll bars and steering systems. The final two chapters deal with the simulation output and interpretation of results, and a review of the use of active systems to modify the dynamics in modern passenger cars. This book intended for a wide audience including not only undergraduate, postgraduate and research students working in this area, but also practicing engineers in industry who require a reference text dealing with the major relevant areas within the discipline. Practicing vehicle design engineers and analysts; Postgraduates in Automotive Engineering. Other undergraduates in civil engineering or transport studies studying automotive option units. 1.2 What is Vehicle Dynamics? Damian Harty is a Senior Staff Engineer at Polaris Industries based in Minnesota. He was formerly Director of the Vehicle & System Dynamics Group at Coventry University, a Technical Specialist for vehicle dynamics with Prodrive on the Mini WRC, as well as a freelance consultant. Senior Staff Engineer at Polaris Industries, Minnesota, USA.